Excel template is much more effective. And Microsoft Excel is standard available on most business computers (PC or Mac). 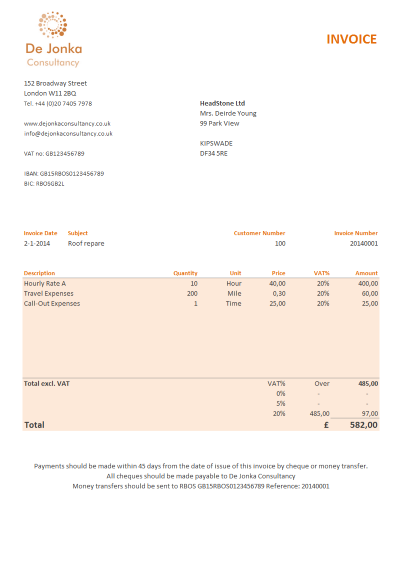 The invoice template works both on Mac and PC with Microsoft Excel. Simple and concise reports give immediate insight in your sales. 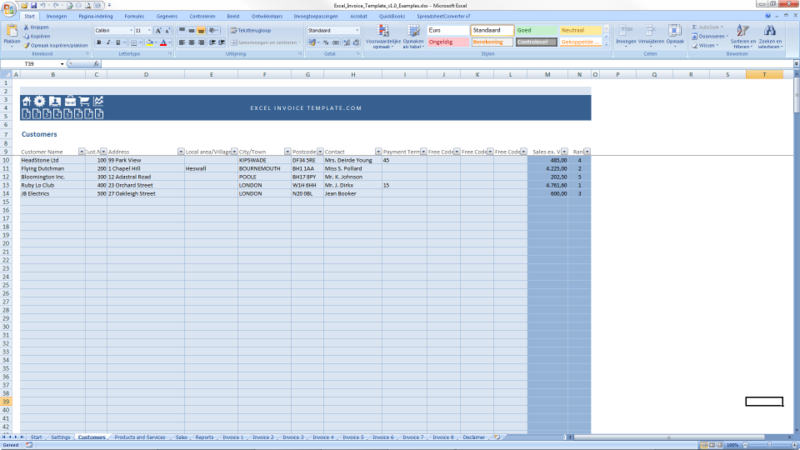 Create Excel Invoices In 3 Simple Steps! Discover how easy it is to create your invoices. Create professional looking invoices in just 3 simple steps. Enter your organisation details in the system once. Then add your customers and products/services in the table, so you can quickly and easily select them when recording sales. Simply add new products/services or clients later to any of the tables. Record your sales by filling just 5 cells. Add a subject line to your pleasing. 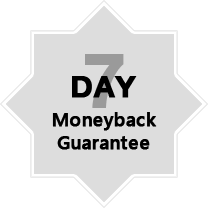 Last step is to select and print your invoice. Save the invoice as a PDF-file to send it to your client by email and get paid faster. By the way, did you know that invoices with color get paid faster than black and white invoices? That’s Cool… But What Else Can Excel Invoice Template Do? 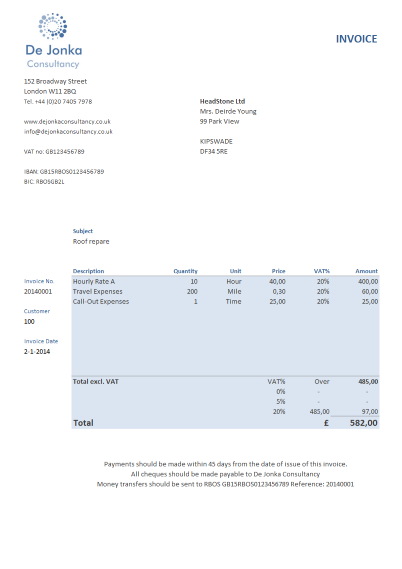 The Excel Invoice Templates is the most professional and complete invoice system using Excel for Mac and PC. All invoices are saved in the database. One-click lookup. Save your invoice as a PDF, email the file to your client and get paid faster. 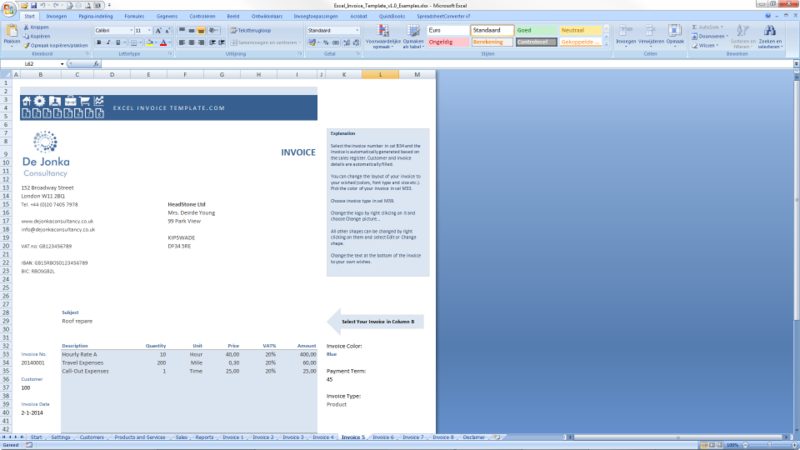 Excel Invoice Template is the most complete invoice system using Excel for Mac and PC. 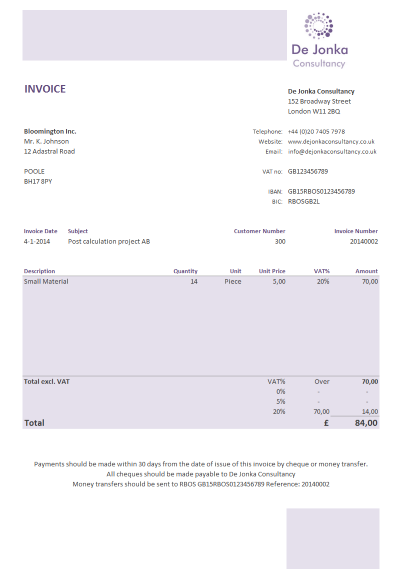 Save a lot of money by simply creating your invoicing using anExcel Invoice Template. One time payment. No subscriptions. Simple editing. Complete freedom. All designs are quickly accessible by the top menu bar. Even color names can be changed. Since you are working in Excel, you can change anything you like: fonts, colors, cell width, move cells etc. The Excel Invoice Template is protected without a password. Simple and easy to understand are automatically generated and updated each time you enter a sales transaction. 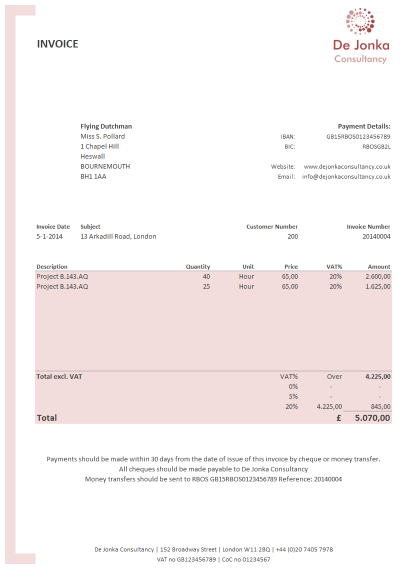 Because you record your sales in a separate table, all invoices are saved and easily reprinted or resend. 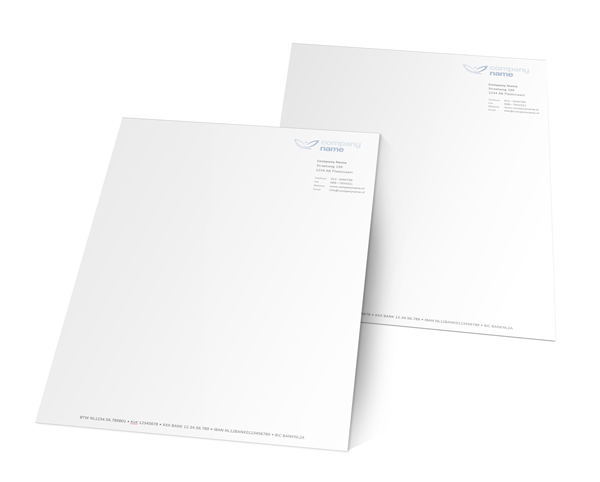 Save money on designing and printing expenses for your letterhead. Simply use on of our Word-templates to create a beautiful looking letterhead. You don't have print your letters on expensive preprinted paper with your letterhead as a small business owner. It is a lot cheaper and faster to print your letters with your letterhead using a simple Word-template. You get 3 letterhead designs in Word as a free bonus. Both writing paper and continuation paper are included! Simply change your logo and company details in the header. You can add the page number in the footer as you please. You will find full instructions in the Word-templates. 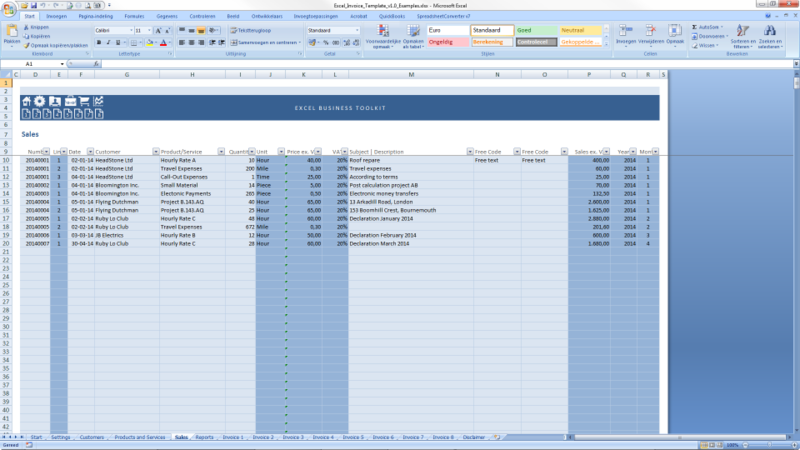 The Excel Invoice Template is exactly as promised. Strong improvement from the previous version. 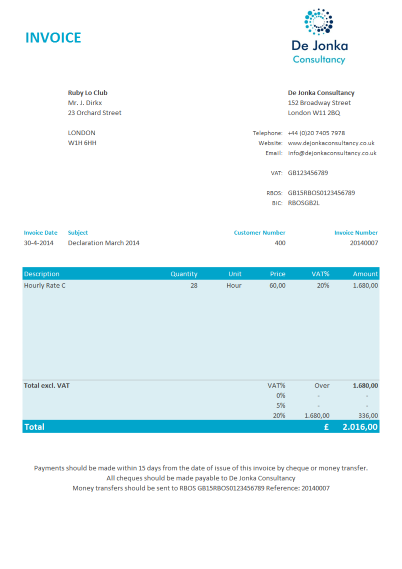 Very handy template for a beautiful and clear invoice. Minor modifications are also possible, which is a plus. Create an invoice in less than 2 minutes!! 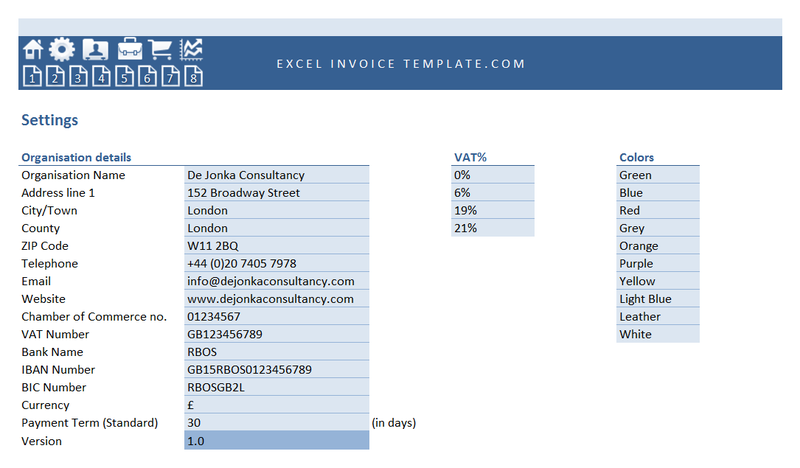 I am a very happy user of the Excel Invoice Template. You only have to input your customers and products once to select them from a dropdown menu when creating your invoice. Super useful! Very satisfied! Can I change the Look & Feel, such as colors, fonts, column width etc.? Yes, you can change anything you want. The template is protected without a password. So, if you have some Excel skills you can make any modifications you want. Also, without unprotecting the template - saver if you don't have Excel skills - most cell properties can be modified. Do I have to buy a new template each year? No, the Excel Invoice Template is suitable for all years. It is recommended to start with an empty new template each year for reporting purposes. What if I don't sell physical products? 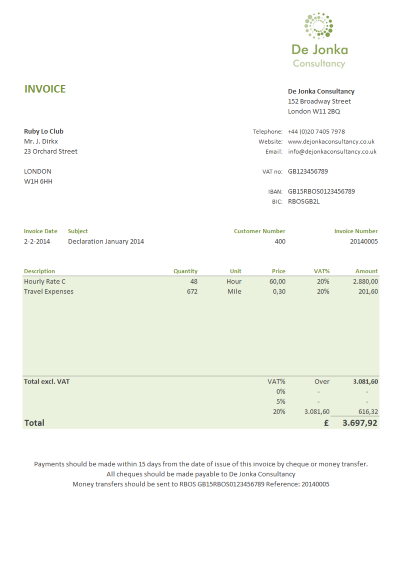 The Excel Invoice Template can be used for both physical products as services. Simply select the type of invoice you want to create and the system will make the required changes. How do I change the logo on the letterhead? Changing the logo is easy. Simply right click on the image and select Change picture... Now choose an image from your harddrive.